Sheila Loudon Ross in her book "Weather and Climate: An Introduction" published in 2017, names climate change as "climate disruption, climate chaos and climate crisis". This definition fits well with Cyclone Idai's crisis-induced weather, which has been preceded by unpredictable weather patterns, frequent droughts, floods, high temperatures and many other disruptive weather conditions in recent past. That Zimbabwe has committed itself to adapting to climate change is of no doubt, but more needs to be done to ensure the adaptive capacity is improved so as to caution victims. Mobilisation of resources in such a disaster should be of uttermost importance, with millions of dollars needed to ensure everything is in place. Guided by the provisions of the United Nations Framework Convention on Climate Change and the Kyoto Protocol, there is need to mobilise everyone to ensure that the country's adaptive capacity to climate change is top-notch. Climate change adaptation is heavily-linked to development, and there is no way Zimbabwe can progress without tackling the effects of climate change. While climate change does not cause poverty, it actually worsens it due to its effect on the livelihood of people. This is why there has been increasing calls to link climate change to development, hence our appeal for more robust ways of adapting to the weather phenomenon. We are aware of the National Climate Policy and the National Climate Change Response Strategy, whose bid is to consolidated the adaptation processes to climate change in Zimbabwe. It is these national policies that should guide the authorities in building the adaptive capacity to climate change, but recognising that climate change occurs in a multiple-stressor environment, making it a complex issue. This calls for a holistic approach to fighting the effects of climate change and ensure that communities are cushioned even in the event of devastating cyclones. Cyclones that hit Zimbabwe have increased in the near past, a sign that climate change is fast taking its hold on the country. There was Cyclone Eline in 2000, Cyclone Japhet in 2003, Cyclone Dineo in 2017 and now Cyclone Idai, all with devastating effects. As a developing country with less resources to facilitate easy adaptation to climate change, Zimbabwe has to go the extra mile, especially when such disasters occur. 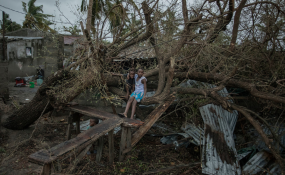 But the consequences of climate change are inevitable, and we experiencing them through cyclones like Cyclone Idai.